Thank you for sharing your experiments online. Thank you for sharing! I do love your in-depth explorations into dyeing with plants. 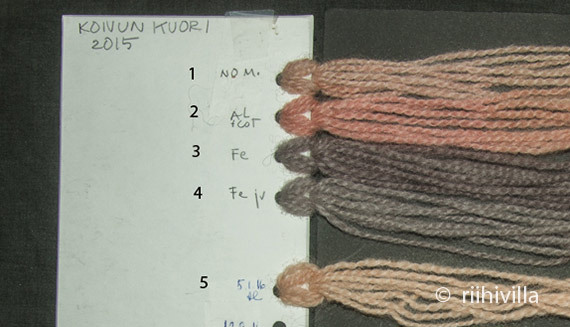 I have seen wool dyed with birch bark that was fairly deep brownish red. The lady said she added wood ashes to the bath and dyed in an iron pot. The colour was great and the wool was a bit ruined. I decided not to use her procedure. A year later I saw an exhibition of felt pictures, here in Slovenia. And noticed the reddish colour in a picture by this lady: the wool came out beautiful and didn't seem destroyed a bit. So I decided I might try dyeing carded or spun wool mordanted with iron, using an alkaline solution to extract the reds from the barks. 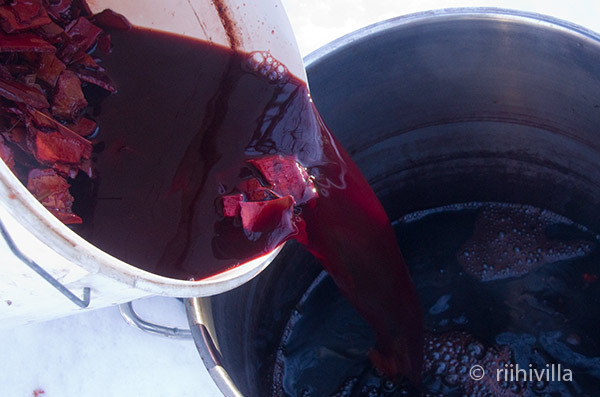 Will have to try cold dyeing at first, trying to avoid the destructive effect of iron on wool. 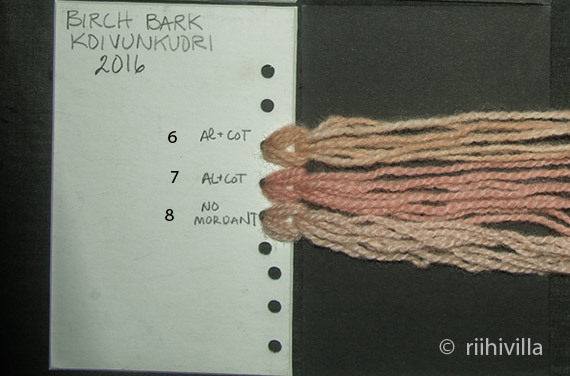 For me the color always turns greyish when I use iron with birch bark (I've tried it also with the older barks earlier, also as afterbath), perhaps there are differences in the dye contents in barks grown in different places. Though I haven't tried dyeing in alkaline bath and then using iron, but I doubt that I would get anything other than grey, again. I've had to overdye so many ugly grey yarns over the years, but perhaps next time if I try to dye in alkaline bath I would remember to add just a small piece of yarn for modifying with iron. Thanks for telling me about these experiences! Yesterday I had an unexpected opportunity to speak to the lady who had dyed with birch bark. She said she used enormous quantities of barks, she soaked/cooked them really long. 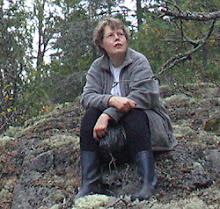 To the strained red solution she added wood ashes and wool and then HEATED it. It resulted in red wool that looked rather ruined. To me it seemed suitable only for felting. 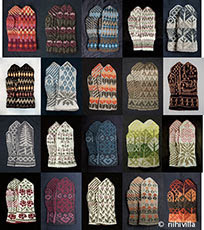 And the wool she uses is from Slovenian native sheep breed from Jezersko-Solčava and is medium coarse. i second the thank you for sharing. 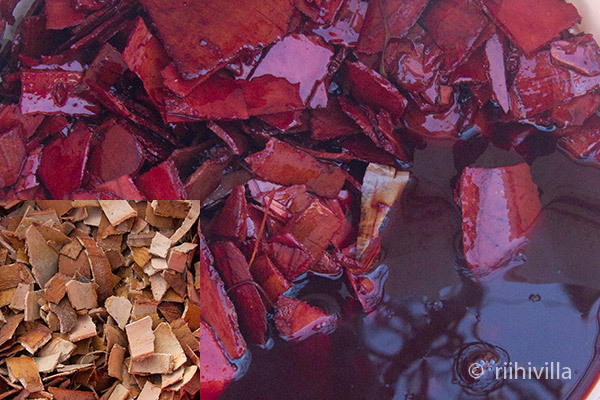 your work is very important to the natural dye community. i always learn from your blog posts. Thank you Velma:) There are so many things to try (and so little time), and when you add to it that circumstances can be different and dye may react differently these my experiences are just a tip of an iceberg:) That is the good thing about natural dyeing. Thank you Judy, I hope these my experiments help you, I know they help me when I dye again with the same dyes. I wish had gotten darker color as the bath was very dark, but I will post later if the longer soaking of the yarn in the bath helps. I have learned so much myself since I started this blog!